Suavecito Pomade may be the most popular hair product and best pomade for men in 2019. In fact, Suavecito Pomade Firme and Original Hold styling products are heralded as all-in-one, universal solutions to getting the best men’s hairstyles. In this Suavecito Pomade review, we’ll be looking at some of the pros and cons of this pomade as a hair styling product, and sharing tips on how to use and apply Suavecito pomade when styling your hair. Whether you’re styling a slicked back, pompadour, quiff, comb over, side part or any other cool men’s hairstyle that requires a strong hold with shine, this Suavecito review will guide you on choosing this water-based pomade as your go-to hair product! 1 What Is Suavecito Pomade? 2 What Makes Suavecito Pomade Special? Suavecito pomade is a popular water-based pomade recognized as one of the best on the market. This particular hair product comes in two varieties: Original and Strong Hold, depending on your styling needs. Both men’s pomades are “medium shine” products, although the company just launched a new matte pomade. Suavecito’s pomade has the appearance of a thick, dark honey gel (with none of the stickiness) and offers a renowned sweet smell similar to a manly scent like that of an old-fashioned cologne. The consistency is smooth and creamy, with few lumps and zero grains. When you rub it between your hands, it spreads and warms easily, permitting you to apply it without trouble. The fact that Suavecito pomades are water-based means that they’ll never leave your hair feeling greasy or sticky (nor will they affect your scalp for this reason), and can easily be washed off with water. Water-based pomades also allow guys to easily fix their hair throughout the day by simply applying a small amount of water to re-hydrate the product. Ultimately, these benefits make using and applying Suavecito pomade easier than other hair products, especially gels! As we mentioned before, Suavecito Pomade comes in both Firme and Original hold, which translates into strong and medium-strength holds. Obviously, how long your hair stays styled and controlled depends on how much of the product you use, but generally speaking, Suavecito will last you all day without needing any restyling. What Makes Suavecito Pomade Special? In all fairness, a lot of water-based pomades (e.g. Layrite) share the advantages mentioned above – clean and never sticky or greasy, reworkable, and easy to wash off. So what makes Suavecito pomade so special and is Suavecito pomade even worth buying? In addition to a high-quality finish that won’t leave your hair feeling hard or flaky, Suavecito is one of the most affordable pomade brands on the market. We’re not exactly sure how they do it, but Suavecito pomades are some of the cheapest per ounce. In comparison to other trendy brands such as Layrite, Uppercut or Baxter of California, Suavecito pomade always costs less (and sometimes less than half as much as other major competitors). Combine the excellent quality and strong hold with a low price tag, and this is what makes Suavecito so popular and worth trying. Like most hair products, Suavecito pomade is easy to use. When using or applying, grab a few pea-sized blobs of pomade with the tips of your fingers and rub it between your palms. If desired, wet your hands for a lighter finish. Note that, like most men’s pomades, Suavecito applies best to clean, slightly damp hair. Pro Tip: Use more pomade for finer hair and less for thicker hair. And for a textured hairstyle with less shine, apply pomade to dry hair. Slicked Back: Run your hands from front to back following the natural curvature of your head. Repeat multiple times to clean all the Suavecito pomade from your palms and finish with a hair comb for the perfect density. Suavecito was definitely made for use with slicked back hair. Messy Hairstyles: Run your hands through the top of your hair in whichever directions you please. Switching directions won’t reduce the effectiveness of the pomade, allowing you to get the ultimate messy finish. Quiff: Run your hands through the top of your hair at a steep, upwards angle, using the length of your hair to push it backwards and up, or even slightly sideways. Repeat multiple times, and, if desired, finish with a comb for a textured style. While most men won’t care, it’s important to note that there are no harsh chemicals in this water-based pomade. The ingredients in Suavecito Pomade won’t cause acne on your scalp or forehead, or make it difficult to wash out. Suavecito pomade is clearly one of the best pomades for men, making it very easy for us to highly recommend it. Suavecito offers a clean, shiny finish with all the perks of a water-based pomade. 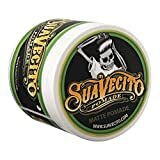 At similar price points, the Suavecito Original and Strong Hold pomades are quite the bang for your buck, considering their excellent quality. If you decide to try Suavecito’s Firme Hold Pomade, you can certainly do so with confidence!